The second major in the tennis season and it’s Parisian red dirt always holds a unique place in the history books. More often than not it has proved the toughest nut to crack and/or a bridge too far for the world’s best over the years. Then, as with the majority of tournaments big and small, there will be the players that put together incredible winning streaks and this weekend has seen both the unfancied triumph and the most dominant of players extend their incredible reign. Clearly being the first Latvian to reach even the SF of a major wasn’t enough for Jelena Ostapenko who fearlessly hit winner after copious winner against all who faced her. Usually the UE count begins to creep higher and higher as the latter stages approach and the opponent’s quality grows- but not here. Clearly poor Simona Halep thought the same; the Romanian played it so safe come Sunday after her own titanic efforts to once again reach the final in Paris. But it was too safe an approach against such consistently accurate firepower. Yes Ostapenko was misfiring early on – hence the set and 3-0 lead amassed by Halep before too long – but in a Radwanska-esque vein there was no killer instinct when it mattered most. For all their guile and comfort with shot selection, power is sorely missing from these two players. A dream realised for Ostapenko then, Halep should have more chances. This was truly frightening stuff – even greater in some ways than Roger’s triumph in Australia. Two years ago we saw the King of Clay well beaten here by the rampant Djokovic; such an alien sight. Then, a year ago the world glumly nodded in acknowledgment that those imminent injuries had finally taken their toll on the greatest clay player ever seen. 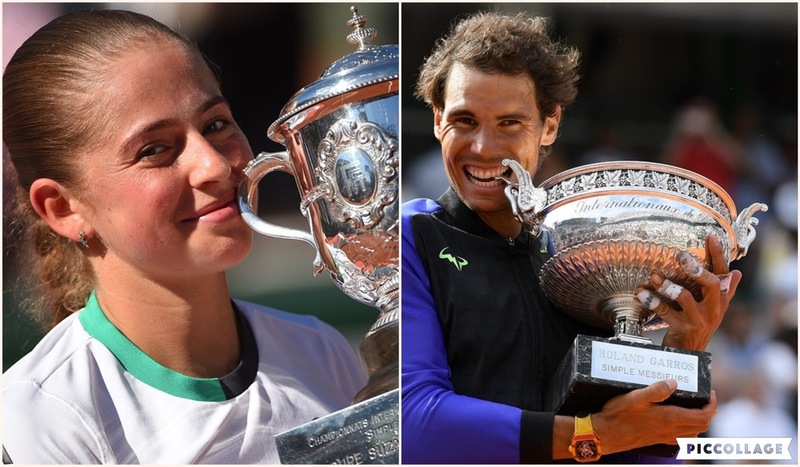 Rafa’s resurgence on all surfaces this year has been shadowed by Federer’s respective bettering of the Spaniard, but remove the Swiss from the picture – as in the entire 2017 clay season – and you are left with Nadal back to his absolute all-conquering best. Imperious all fortnight, not even looking like dropping a set; it was the final against a player in Wawrinka who has never tasted defeat in a major final. On the contrary, the Swiss would only reach a higher level and become unplayable come the final grand slam hurdle. Jim Courier worded the match perfectly – this was not a contest but a coronation. Decima fulfilled and no-one in our lifetime will ever come close to commanding such authority on clay. The GOTY debates would always have included Rafa and Roger together – such are their playing styles that they cannot be compared at face-value. What may change now are those stats – Rafa surely has it in him to go on and on, not just here but throughout the season.